Vivacious and continuously upbeat, the author leads the listener through one of her successful writing workshops. DiMaggio has written many hours of television and feature films, and she also adapts books for film and writes made-for-TV movies. Her focus in this workshop is the writing of screenplays, with an emphasis on the importance of choosing a point of view when writing for television or movies. 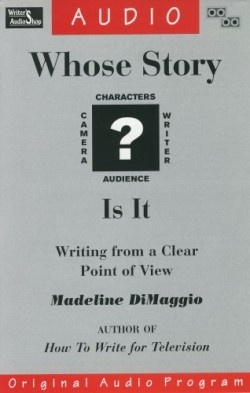 She discusses many possible points of view, including those of the audience, the main character, the author, or all of the characters in the story. DiMaggio’s own point of view is that of a former actress who decided to try her hand at writing for television. She stresses the fact that it can take a long time, possibly years, for ideas to culminate into the production of a pilot for television. She shares personal anecdotes, and laughs at herself and the mistakes she made along the way, but she also becomes serious enough to confer practical advice. She recommends that aspiring screenwriters buy screenplays to read and research, and watch carefully what is being produced on television and in the movies, and she cautions writers to have the patience to wait until their idea is one whose time has come. DiMaggio concludes her workshop with a display of the confidence of a successful screenplay writer. She declares that one of the most important aspects of writing is the love of the process, and not just the potential outcome.